The Baltimore Comic-Con is excited to announce the addition of artist/musician Billy Martin to the growing list of talented guests attending this year’s show. The show will be held at the Baltimore Convention Center the weekend of September 7-8, 2013. Billy Martin, a native of Annapolis, MD, is probably best known as the lead guitarist of the band Good Charlotte. 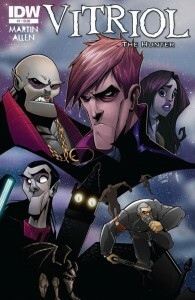 But, in addition to creating his music, he is currently drawing and co-writing Vitriol, The Hunter for IDW Publishing. As his first foray into comics, Vitriol is a six issue series that brings together grisly, gothic horror with sci-fi adventure set in the year 2127 in the fictional city of Basilika. The series follows the journey of Basilika City’s last great hope, Vitriol, as he stands as the only force that can stop Lord Barthus and his heinous vampire regime from overtaking the city. In addition to drawing and co-writing the series, Martin is also produced a soundtrack inspired by the themes and setting of Vitriol. Under the name Villain, Martin has been creating remixes, as well as writing and producing music for other artists. The soundtrack has been made available for free download inside the first issue of the comic. Although IDW is exhibiting at show, Billy will be set up in Artist Alley, at table #A340. Martin joins our previously announced guests, including: Josh Adams (Doctor Who); Neal Adams (First X-Men); Mark Bagley (Fantastic Four); Art Baltazar (Aw Yeah Comics!, Tiny Titans); Brian Bolland (Dial H); Harold Buchholz (Archie Comics); Mark Buckingham (Fables); Sal Buscema (Amazing Spider-Man); Frank Cammuso (Knights of the Lunch Table, Otto’s Orange Day); Jimmy Cheung (Avengers vs. X-Men); Frank Cho (Savage Wolverine); Steve Conley (Bloop); Amanda Conner (Before Watchmen: Silk Spectre); Jamie and Tyler Cosley (Cody the Cavalier, Ninja Squirrel); J.M. DeMatteis (Phantom Stranger); David Finch (Justice League of America); Franco (Aw Yeah Comics!, Tiny Titans); John Gallagher (Buzzboy, Roboy Red); Zack Giallongo (Broxo); Chris Giarrusso (G-Man); Keith Giffen (Masters of the Universe); Jimmy Gownley (Amelia Rules!, The Dumbest Idea Ever! ); Joe Hill (Locke and Key); Jason Horn (Ninjasaur); Adam Hughes (Before Watchmen: Dr. Manhattan); Denis Kitchen (The Oddly Compelling Art of Denis Kitchen); Barry Kitson (Empire); Roger Langridge (Popeye); Paul Levitz (World’s Finest); Kevin Maguire (World’s Finest); Mike Maihack (Cleopatra in Space); Mark Mariano (Happyloo); Dave McDonald (Hamster Sam); Mark McKenna (Star Wars, Banana Tail); Jason Mewes (Jay and Silent Bob’s Super Groovy Cartoon Movie); Mike Mignola (Hellboy In Hell); Jamar Nicholas (Leon: Protector of the Playground); Chris O>Matic (The Chris O>Matic Show! ); Jimmy Palmiotti (Batwing); Dan Parent (Archie, Veronica, Kevin Keller); George Perez (World’s Finest); David Petersen (Mouse Guard); Joe Prado (Earth 2); Ivan Reis (Aquaman); Dave Roman – Saturday only (Astronaut Academy, Teen Boat); Chris Samnee (Daredevil); Jeff Schultz (Archie, Jughead); Louise Simonson (X-Factor); Walt Simonson (The Mighty Thor); Kevin Smith (Batman: The Widening Gyre); Allison Sohn (sketch card artist); Frank Stack (My Cancer Year); Bobby Timony (Night Owls, Detectobot); Mark Waid (Indestructible Hulk), and Bill Willingham (Fables).